Zion Market Research has published a new report titled “Predictive Analytics Market by Software Solutions (Data Mining & Management, Decision Support Systems, Fraud & Security Intelligence, Financial Intelligence, Customer Intelligence and Others) for Customer & Channel, Sales and Marketing, Finance & Risk and Other Applications: Global Industry Perspective, Comprehensive Analysis And Forecast 2016-2022”. 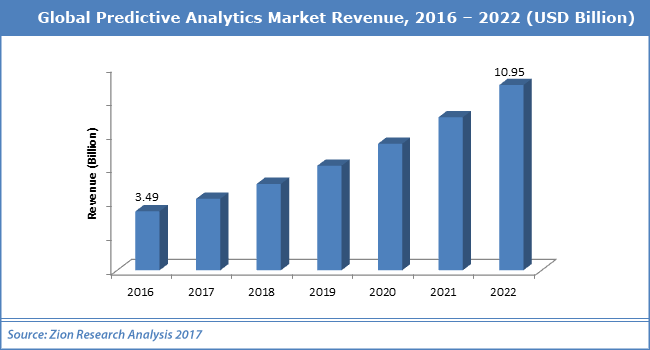 According to the report, the global predictive analytics market was valued at approximately USD 3.49 billion in 2016 and is expected to reach approximately USD 10.95 billion by 2022, growing at a CAGR of around 21% between 2016 and 2022. Predictive analytics explores large quantities of data and past events to identify patterns and build forecasts about future events. It is a set of different techniques and technologies that cover machine learning capabilities and improved big data aggregation technologies. Predictive analytics helps to solve real world’s problems in economics, business, government, and others. It is widely used in different sectors like BFSI, IT, telecommunication, retail, healthcare, food & beverage and government. Predictive analytics process includes data collection, data mining, statistics, modeling, deployment, and monitoring. This is used in customer relationship management, health care, collection analytics, cross-sell, fraud detection, risk management, direct marketing, underwriting, and others. The predictive analytics market is segmented on the basis of deployment into cloud based & on premises installation. The cloud-based segment accounted for the largest market share in 2016. This segment is expected to show significant growth due to increasing IT priorities among different enterprises over the past couples of years. Based on software solutions, predictive analytics market has been classified into financial intelligence, customer intelligence, financial intelligence, decision support systems, data mining and management, fraud and security intelligence and others. Among these software solutions, customer intelligence and fraud and security intelligence solutions are projected to dominate the market over the forecast period. This mainly due to high adoption of these models by BFSI companies on account of escalating incidences of defaulters and stringent regulations for ensuring compliance with banking principles. The predictive analytics market is segmented on the basis of end- use which includes banking, IT, financial services & insurance, government, retail, public administration & utilities, telecom, healthcare, manufacturing, and others including energy, media & entertainment, etc. Among all segment, banking, financial services & insurance accounted for major share and predicted to continue this trend over the forecast period. Growth can be attributed to rising product quality in financial service sectors to deliver favorable results. Increasing the awareness of predictive analytics in all industries is leading substantial market growth. Key application areas for predictive analytics includes customer & channel, sales and marketing, finance & risk and others. North America leads the predictive analysis market due to technological advancements, followed by Europe and APAC on account of increasing awareness about the market. Many players in predictive analytics market are offering services and solutions globally. Some of them are Tableau Software Inc., Information Builders, Fair Isaac Corporation (FICO), and TIBCO Software Inc, SAS Institute, Teradata Corporation, Acxiom Corporation, SAP SE, TIBCO Software Inc, Microsoft Corporation, IBM Corporation and others.